Turkey’s Justice and Development Party (AKP), after coming to power in 2002, sought to play a larger diplomatic role in the Middle East. The AKP adopted a proactive foreign policy to create ‘strategic depth’ by expanding Turkey’s zone of influence in the region, drawing on the opportunities of geography, economic power and imperial history to reconnect the country with its historical hinterland. Yet despite early promise, this policy came undone after the Arab upheavals of 2011 and has seen Turkey increasingly at odds with its neighbours and the West. 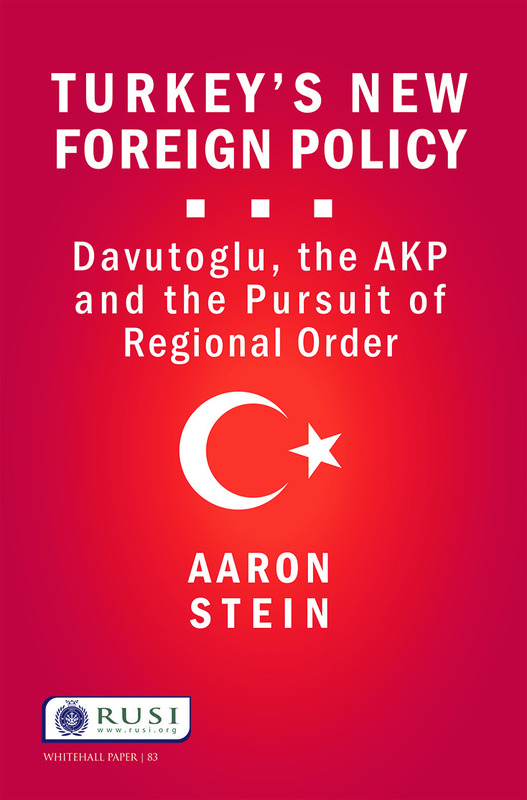 Turkey's New Foreign Policy outlines the key tenets of the AKP’s policy of strategic depth in the Middle East and how this marks a departure from traditional Turkish foreign policy. Particular attention is focused on the Turkish reaction to the political changes that swept through the Arab world – including the Syrian civil war – and presented Turkey with its most significant foreign-policy challenge to date. Based on extensive primary research of Turkish-language sources, this monograph argues that political changes in the Middle East have precipitated a serious decline in Turkish regional influence, reversing earlier gains in influence after the AKP came to power. However, despite these foreign-policy defeats, the AKP has shown little indication that it is willing to scale back its ambitions, insisting that it stands on the right side of history – drawing a clear distinction between Turkey and the West. Aaron Stein is an Associate Fellow at RUSI and a PhD Candidate at King's College London, where he is researching Iranian and Turkish nuclear decision-making. He holds a BA in Political Science from the University of San Francisco and a Master’s degree in International Policy Studies with a specialisation in nuclear non-proliferation from the Monterey Institute of International Studies. He has written extensively on Turkish politics and regional proliferation, publishing in scholarly journals and print media, including Survival, the RUSI Journal, the New York Times, Foreign Affairs, Foreign Policy, the Bulletin of Atomic Scientists and the National Interest.